Hounaida Lasry, Vice President P&G Pet Care EMEA & Asia, and Rafael de Santiago, President of the FCI, continue to be ‘Partners in Excellence’ for the coming years. Passion for purebred dogs is at the heart of both the FCI and Eukanuba, and in February, 2014 the two organisations announced the continuation of their joint efforts with the signing of a new 3-year ''Partners in Excellence'' agreement. This remarkably successful collaboration began in 2006, and among its achievements has been the birth and rise of the Eukanuba World Challenge. 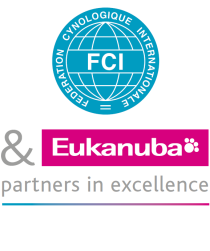 The continued cooperation of Eukanuba and the FCI reflects their commitment to excellence in the world of purebred dogs. As a brand, Eukanuba provides 100% complete and balanced quality nutrition designed to bring out the best in every dog. This ethos combined with the FCI's global involvement within the purebred dog community and its activities has created a partnership well-positioned to further enhance the relationship between dogs and those who love them. Eukanuba and the FCI anticipate new opportunities to celebrate the work of breeders and exhibitors in the coming years. With a thriving membership in Eukanuba's Breeders Club, and the FCI's strong connections to the international dog world, the two organisations are the very heart of the purebred dog fraternity. We spoke to Mr Santiago, as well as José Luis Ibáñez, Influencer Channel Leader EMEA, about the new announcement and about their views on the collaboration itself. The FCI and Eukanuba can proudly look back at seven years of being ''Partners In Excellence''. How did it begin, and how has it evolved over time? RdS: Our original objective was to partner with the very best pet food company the market could offer, and we found that in Eukanuba. The partnership has been so successful on many levels, and I believe in the minds of breeders the FCI and Eukanuba are now viewed as faithful partners. We have managed to develop not only an efficient business relationship but excellent personal relationships as well. We are seen as a joint presence at all of the major FCI shows, and we are delighted with our cooperation. JLI: This is the third renewal for our contract, and I must say I am very happy to continue this wonderful alliance. It has already proven to be a beneficial for both of us, and we are growing closer year by year. The FCI's involvement has seen the perception of the Eukanuba brand evolve among those in the breeder world, and has allowed us to demonstrate our commitment to those who breed and exhibit dogs. What factors make the FCI and Eukanuba a winning team? RdS: The FCI is at the forefront of 89 kennel clubs, and that has given Eukanuba an ''open door'' to all of them. In turn I think the members of these clubs benefit from Eukanuba's involvement in terms of their expertise on nutrition, and their assistance at national and international events. Eukanuba continues to demonstrate that it values the dog show community, and the live-streaming it provides at the major shows is a reflection of their modern, high-tech approach. JLI: Not only do we achieve great results together, this is a winning team because of the people involved. There is so much excellent cooperation, and honest communication with the FCI. That includes not only Rafael, but also Hans and other members of the FCI board throughout the years. We all strive to do what is right for dogs, their people and for the organisations. With regard to the live-streaming, we think that this is just the beginning. We want to explore the full potential of the digital sphere and break new grounds online. Among many other great ideas, the partnership gave birth to what has become one of the most coveted events in the dog world, the Eukanuba World Challenge. How do you view this event? RdS: The show has truly reached global proportions! It is considered a ''must'' in our members' schedules, and this is a remarkable achievement when you consider the relatively small number of years it has been in existence. The concept of the show is so unique, and we are aware this would all be impossible without Eukanuba's assistance. We are proud to be a big part of this world-class show! JLI: I consider the EWC to be the ''crown jewel'' of our collaborative efforts! The FCI was on board from day one. Together we have created a very prestigious event that has grown bigger and better every year. Today it is regarded as ''THE'' dog show and I could not be more proud of it! Even more gratifying for me is to learn that so many of the winning dogs are fed on Eukanuba, which brings things full circle!